The idea behind "Musekeweya," or "New Dawn," is to do the opposite of what the government's notorious "hate radio" did 20 years earlier. The Rwandan genocide took place 24 years ago. As many as a million people died. Years later, Rwandan writers, led by a Dutch NGO, launched a project to encourage reconciliation through a radio soap opera. The show is still going strong, and it reveals something universal about human behavior. Here's NPR's Shankar Vedantam. SHANKAR VEDANTAM, BYLINE: In 1994, a radio station in Rwanda began transmitting urgent messages to the population of 7 million - sharpen your machetes; it's time to kill your neighbors. VEDANTAM: Very few recordings of these broadcasts exist today. Here's one. 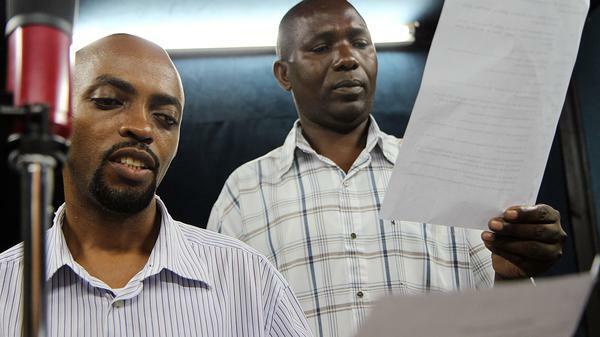 UNIDENTIFIED PERSON: (Through interpreter) Rwanda belongs to those who will truly defend it. And you, the cockroaches, are not Rwandans. The cockroaches will not escape. VEDANTAM: The Rwandan government, dominated by the Hutu ethnic group, was in the process of dehumanizing the Tutsi group. One study calculated that hate radio had convinced an additional 50,000 people to murder their neighbors. VEDANTAM: This is Andre Musagara. He talked to us via Skype from Rwanda. During the genocide, he lived in Kigali, Rwanda's capital. He told me armed men came to his house and dragged everyone outside. MUSAGARA: I couldn't even look at them straight in the eyes, they were so terrible. It's like they didn't want, you know, anyone to identify them, so they would say lay down and whatever - and yeah. It was a hard moment. VEDANTAM: By the time the Rwandan Patriotic Front defeated the Hutu government a few months later, the country was in ruins. For Ervin Staub, a Holocaust survivor and expert on the causes of genocide, it all seemed eerily familiar. ERVIN STAUB: I do remember being very upset that nobody was doing anything. VEDANTAM: Staub got in touch with Rwandan officials to ask how he could help. Among those who stepped forward was Alphonse Bakusi, director of Rwanda's conflict management department. He also had a background in theater. I spoke to Alphonse recently on a scratchy phone line to Kigali. ALPHONSE BAKUSI: I was an (laughter) - I was one of the sentimental actor in my team. VEDANTAM: It was clear that radio could convince people to be violent. Rwandan officials, Ervin and a production team led by a Dutch NGO, Radio La Benevolencija, wanted to also prove that radio could bring people together. The idea they came up with - a radio soap opera. VEDANTAM: "Musekeweya" tells a story of two fictional villages - Muhumuro and Bumanzi - and two star-crossed lovers from rival ethnic groups. VEDANTAM: Andre Musagara is now the director of the show. MUSAGARA: People are very interested in love, so by telling them this love story, they are easily connected. They can find, you know, something to unite them. Yeah. VEDANTAM: The team wanted the show to convey about a dozen ideas. We'll take a look at three of them. First, violence evolves slowly. Second, bystanders matter. And third, when people form close personal relationships with those from other groups, this provides a barrier to the spread of hostility. UNIDENTIFIED ACTORS: (Singing in foreign language). VEDANTAM: The show was a hit. Anecdotally, it seemed like the messages were getting through. But to find out for sure, the show invited Betsy Paluck, now a professor of psychology at Princeton University, to conduct a rigorous scientific study. BETSY PALUCK: We ran it like a medical trial in which we assigned certain communities to listen to this reconciliation soap opera and other communities to listen to a different soap opera that was about a different topic. VEDANTAM: After one year, Paluck and her team interviewed volunteers. They found something depressing. Ordinary Rwandans weren't buying the psychological messages in the show. They didn't think that violence unfolds slowly or that bystanders can make a difference. They'd seen Hutu husbands kill their Tutsi wives. They didn't think that intermarriage could lead to peace. But they also said something else, something very surprising. PALUCK: They said, however, I do think that now we should allow our children to intermarry; I think that this is the thing that Rwandans are doing; we all think it's a good thing moving forward. VEDANTAM: The show wasn't changing people's beliefs, but it was changing something much more important - their behavior. Paluck thinks the show changed social norms - what people thought was expected of them - and norms are more powerful than beliefs in shaping behavior. PALUCK: We are such social people. If we think that our behavior is going to be really going in the other lane, in the other direction from what people who matter to us - from what they are doing, that really restrains our behavior. So we might think one thing, but eventually do another. VEDANTAM: "Musekeweya" succeeded beyond its creators' wildest dreams. That's the good news. The bad news - if social norms can change in a matter of months from hate to tolerance, can't they go back just as easily in the other direction? Paluck's study provides an important lesson for people, and not just people in Rwanda. The currents that govern human behavior are fickle. If you want to make change and then preserve it, you need to be eternally vigilant. Shankar Vedantam, NPR News. INSKEEP: Wow - 24-year-old news story, and Shankar's still going back there and finding new things about it. He's the host of the Hidden Brain podcast and radio show. UNIDENTIFIED SINGERS: (Singing in foreign language). Transcript provided by NPR, Copyright NPR.